Bitola fire has been contained, but dozen large-scale wildfires still rage across Macedonia, the Crisis Management Center said on Wednesday. Helicopters and airplanes will assist the firefighting efforts in dozen sites where the wildfires are still burning - the village of Smojmirovo, Berovo area, Carevic near Pletvar, Premka-Rbetino, Kicevo area and Rotince, Tetovo area. The fire restarted at Skopje's nearby village of Sveta Petka. The Katlanovo fire is still active. The fire spilled over to the village of Gradmanci and Sveti Nikole. The fire near Jasen national park is of variable intensity and still active. Forest fire has been reported at Skopska Crna Gora, near the village of Rastak. The fire that started near Ljuboten burned out of control and spread on to the village. The Mala Reka fire, near Kitka, eased early on Wednesday but it can restart as daily temperatures are expected to rise. Raovic fire is still burning, whilst the blazes at Gorna Matka have been partially contained. In one of the worse fire seasons ever in Macedonia, the most serious blaze in Bitola's outskirts has been contained. Beside the firefighting efforts on the ground, Croatia's Kanader airplane assisted the operation. The fire near the village of Bucin, Krusevo area, burned out of control as the firefighting efforts are hampered by inaccessible terrain, extremely high temperatures and strong winds. The fire just outside Strumica's village of Sushevo is still active and it spreads onto Turkia dam. The fire burned out of control after consuming 10 hectares of forest and rangeland. Through significant assistance from locals, the blaze near the village of Bogomila was put out. The other two fires near the village of Bistrica and Cresnevo have not been contained yet. 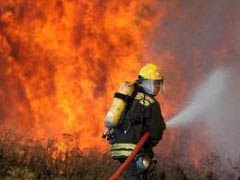 The fire in the municipality of Gevgelija, near the village of Davidovi is still not contained. The blaze consumed some 600 hectares of forest. Wildfire broke out in the area of Pusta Kula, along the highway. ARM soldiers were battling the blaze, which spread onto vineyards near Veles-Skopje highway. Firefighting airplanes from Turkey, Austria and Switzerland are expected to arrive in Macedonia today to help the country hope with the worse fire season ever.